Morocco was represented by Princess Lalla Hasnaa, chairwoman of the Mohammed VI Foundation for the Protection of the Environment at the “Women’s Forum Canada 2018”, held in Toronto May 10-11 under the theme “Bridging the gap: A call to the G7 for inclusive progress”. 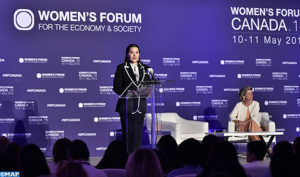 In an address she delivered at a plenary session, held under the theme “working together on climate change, oceans and energy”, Princess Lalla hasnaa focused on the key role played by women in global climate action, through their commitment, their perseverance and their achievements on the ground. In this connection she paid a special tribute to women from the countries of the South for their struggle, especially African women. Concerning what women can do in terms of action for the climate, for the protection of oceans and for the development of clean energy, she said “not only women are at the heart of those issues, at both local and global levels, but they can also bring a unique perspective and contribute original, effective measures that make them key players for change”. As women’s action guarantees and maintains collective vigilance, women’s voices must be heard, she underlined, noting that experience shows that progress – particularly inclusive, sustainable progress – cannot be achieved unless women are involved in it and benefit from it. “This applies to the challenges of inclusive growth and social development. This is even more true when it comes to the nagging, complex issues involved in combating climate change, protecting ecosystems and upholding the universal right to sustainable development,” she added. “In Morocco, we are fortunate to be developing a legal and institutional framework, which is increasingly conducive to environmental preservation,” she said, recalling that thanks to the will of King Mohammed VI, the 2011 Constitution enshrined the right to a healthy environment and to sustainable development. She also explained the actions conducted by her foundation to raise awareness among children, adults, organizations, civil society groups and government agencies to change behaviors for the benefit of the environment. “The action of the Foundation is aimed at raising young people’s awareness about sustainable development – from preschool level to higher education. We do this through programs like Eco-Schools, Young Reporters for the Environment and the network of green universities,” she explained, adding that, to better convince and to convert to sustainable development methods, the Foundation has adopted an approach based on teaching by the example. She added that the Foundation seeks to introduce children, on the ground, to the reality of the sea level rise, droughts, desertification, urban pollution and waste-related issues and threats to biodiversity. “We teach them to sort waste in Eco-Schools so they may reproduce the practice at home. We encourage them to choose a healthier, more environment-friendly diet, to grow their vegetables in the school kitchen garden, to turn organic waste into compost for fertilization and to set up localized irrigation systems to save water,” she noted. “In other programs, such as those relating to air quality and the fight against global warming, we promote conditions conducive to exchange and dialogue. We work towards the emergence of common, accepted solutions, for they are the only ones likely to produce tangible results,” she underlined. The Mohammed VI Foundation for the Protection of the Environment joined broader initiatives, such as those launched by international partners, including UNESCO, UN Environment, FAO, ISESCO, FEE and many others, Princess Lalla Hasnaa recalled. Posted by Hafid El Fassy on May 11, 2018. Filed under Columns, News, Zoom. You can follow any responses to this entry through the RSS 2.0. Both comments and pings are currently closed.